This is where you will find the latest information regarding the club trip to the National Shintani Memorial Tournament. If you are planning on attending this event, be sure to check this page occasionally for updates. What a great trip! Everyone had a terrific time, and there were even a few tears shed when we arrived home and parted company. We will definitely plan another trip. Here are some of the pics so far. Many more to come! You should be able to “Check in” some time tomorrow if you wish. You can do this online ahead of time, or wait until you arrive at the airport and do it either at a Self Check-In kiosk (there are people there to help) or at the WestJet desk. It is at check in that you will receive your boarding pass. DO NOT LOSE YOUR BOARDING PASS! Check the WestJet and Winnipeg International Airport web sites for information regarding luggage and security procedures. Remember to use a small, clear plastic bag for your carry-on liquids like shampoo and stuff. There is a limit to the size of liquid containers you are allowed to bring. No one without a boarding pass is allowed past the security area. You’ll have to say your goodbyes before going through security. Allow plenty of time prior to the flight to arrive at the airport, park, check-in, and get through security. It often takes longer than expected. Please take lots of pictures!! Especially take a group picture at the Winnipeg Airport if you can, and also on the flight to Toronto. We will be trying this: #mmktrip17, so you can take your pics with that. If there’s a way to do so, please share them to our Instagram and Facebook pages. Our Instagram page is “CarlyleKarate” and the Facebook page is @moosemountainkarate for a quick find. The weather forecast is for temperatures around 20˚ with some wind and a chance of rain. Please be sure to bring suitable jackets and shoes, especially for Niagara Falls. The boat tour is famously damp, so be sure you are prepared to be damp and cool. We will be doing a lot of walking along with all the karate, so comfy shoes are important. Take frequent rests and be sure to drink lots of water. 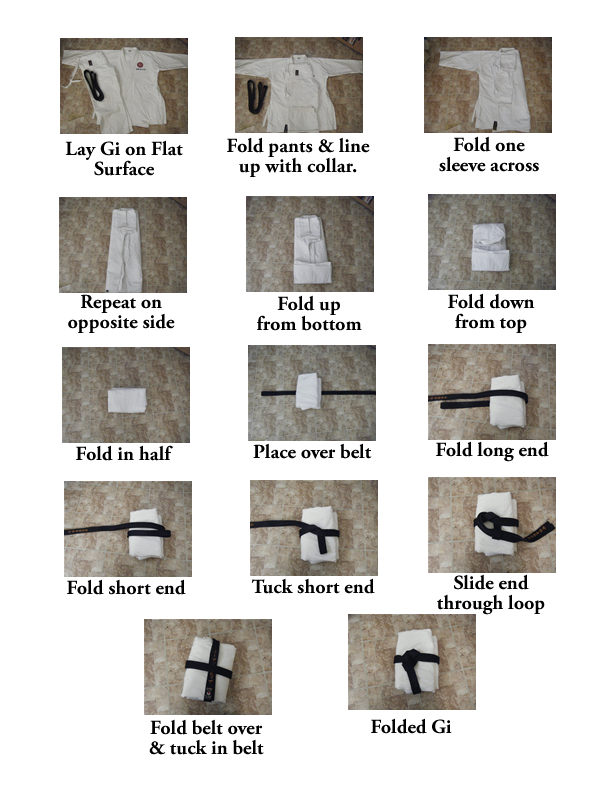 Here’s a series on how to fold a karate gi. The majority of karateka prefer to fold their gi, not roll it. If you have questions, please ask Sensei Kevin at Tuesday’s workout. We will have a brief meeting at 7:30 pm on Tuesday, May 23 at the dojo. There have been a few changes made to the ITINERARY for the trip. Mainly, we are now staying the first night in Toronto instead of driving directly to Simcoe; second, because of this change, we have switched the day we are travelling to Niagara Falls. That will now occur on the Friday. Also, please note the earlier times for the two evening activities, and the start time for the Saturday tournament itself. You will be receiving the updated itinerary at class this evening. Feel free to download it here. The flights have been paid and the airplane seating is in place. It’s “real” now!! We’ll have a brief meeting to discuss the “check-in” procedure. The hotel rooms have been confirmed! Boarding passes will be finalized later today or early next week after the Easter stat holidays. The trip is coming up fast!! Here are the latest documents for the Ontario Trip. The itinerary is a working document and not set in stone. We can be quite flexible with many aspects of our time. Here is the “Letter of Commitment” for the Ontario trip. Please download, read, and return the form by Tuesday, February 14, 2017. There will soon be a “Commitment” letter for interested members to complete and return. This commitment will include a non-refundable deposit of $200 per person travelling under our group arrangements. This will be credited toward the total cost of the trip. 1. You must be up-to-date with your club membership/equipment fees. 2. Anyone 14 years of age or younger must be accompanied by a parent/guardian. 3. You must have participated in club fund-raising activities in order to be eligible for club funding. 4. Participation in the Shintani Memorial Tournament is compulsory. 5. We are travelling as a group from the Moose Mountain Wado Kai Karate Club (MMWKK). All members of our group, whether karateka or not, are representatives of our club and the Carlyle area, and should conduct themselves, at all times, in a manner consistent with the discipline, respect, and humility that is such an important component of all martial arts training. 6. Any plans, made by individuals travelling with our group, to leave the group activities or meet with friends/relatives outside of our group, must be pre-approved by the Senseis of MMWKK prior to departing from Winnipeg. 7. Anyone joining our group (friends/relatives etc) while we are in Ontario will be held to the same code of conduct as the members they are joining. The club members will be held responsible for any inappropriate behaviour by those friends/relatives who joined our group. If a club member is planning to have anyone join us while in Ontario, please discuss this with a Sensei prior to departure.